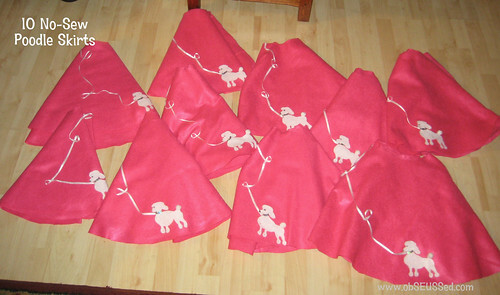 For our 50's Sock Hop birthday party I made 10 poodle skirts as dress-up favors for the girls to wear during the party, then take home. I wanted to keep them simple and low-cost. I made them for about $6 per skirt. Once I made the first one, the rest were much quicker to make so I thought I'd share how I did them to save you some time. I'll admit I don't like making things that require sewing patterns or pinning fabric. I always end up using my seam ripper. 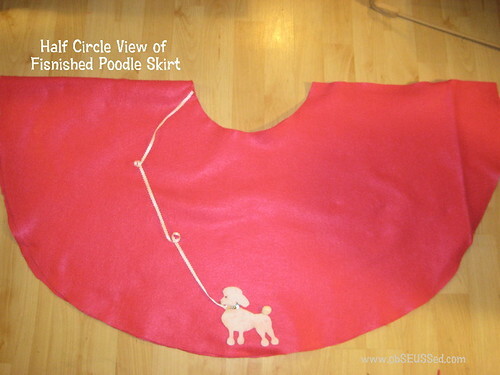 So I came up with this NO-SEW pattern to make a poodle skirt. I also needed them to be adjustable because we had very different waist sizes coming to this party that I couldn't measure in advance. These are perfect for a Halloween costume, playing dress-up or for a dance recital. 7 inch x 7 inch square of white felt (could use black) If you're just making one skirt you could easily buy the 8.5 x 11 sheet of felt from your craft store. If you need to make more, I recommend buying the 72 inch felt off the bolt. 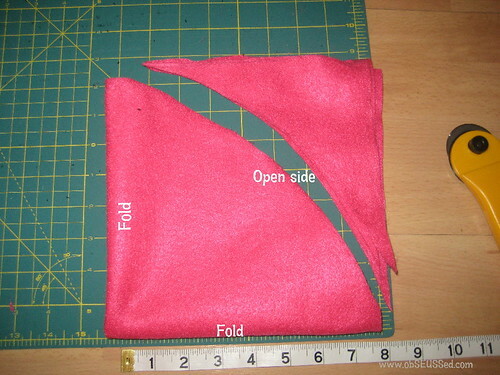 Lay out the felt folded to measure and make sure you have enough fabric. 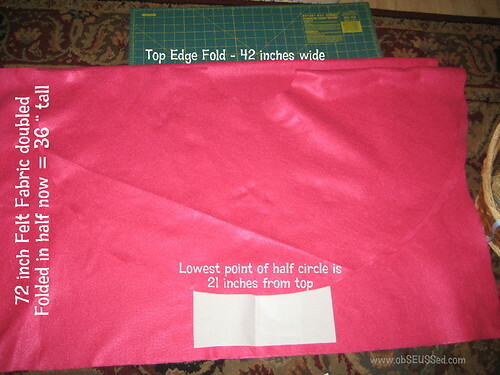 (This picture shows me using my first skirt as a template to copy and trace onto the fabric for my 2nd skirt). Unfold and measure the square 42x42 and cut to make the square. Now, fold the 42x42 square into an 21x21 square. 5. While folded, mark 4 inches from the folded corner on both folded sides. Cut a curved line from each mark. This creates a 16 inch waist opening. It will be adjustable. 6. 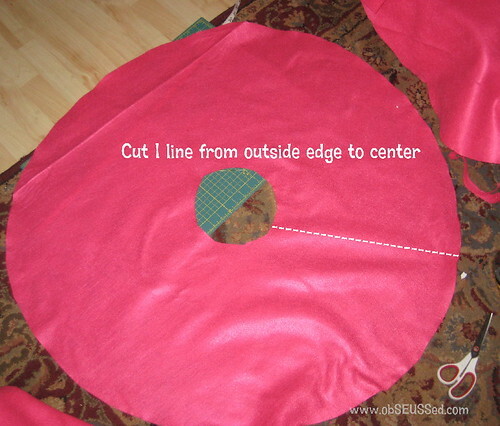 Pick any area and cut a line from the outer edge all the way to the center circle. FREE PRINTABLE: I created this outline. 7. Copy and paste this image into 'Microsoft Word' or another program. You can adjust the size. You'll want it about 6 inches tall. 8. 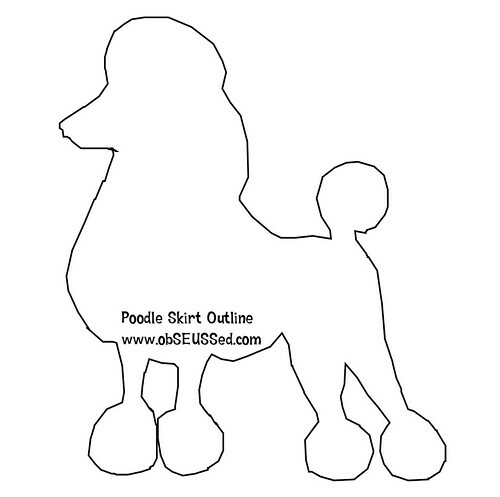 Print the template and cut out the poodle on your paper. 9. Place on white felt, trace around the edge. 10. 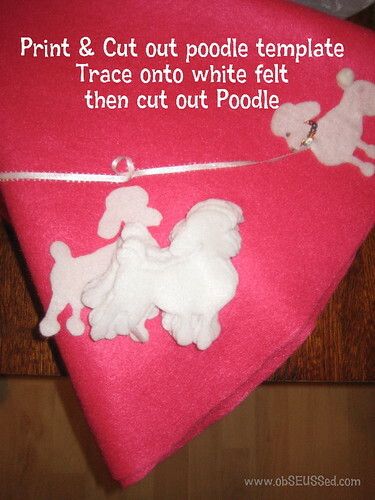 Now cut out the felt poodle. 11. Hot glue the sequin ribbon behind the neck to hold in place on both sides. Hot glue one end of the leash ribbon behind the neck too. Poodle Position: Wrap the skirt around your daughter to see where you want to lay the poodle. 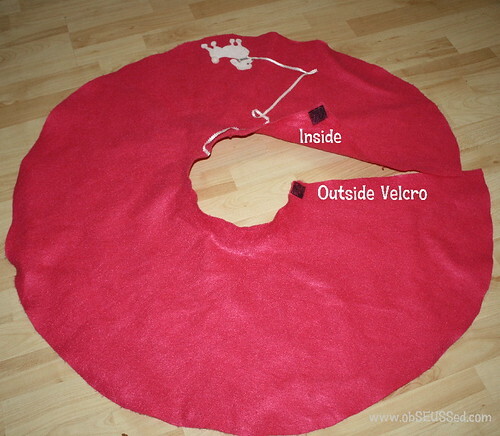 EXCESS WRAP: You can cut the length of the circle shorter if you don't want as much excess wrap. If so, cut it first then add the velcro on the ends as directed below. 12. 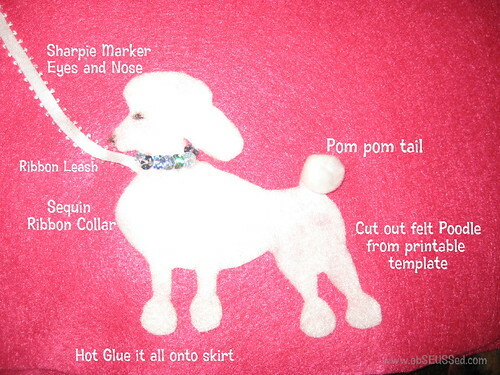 Now, hot glue the poodle onto skirt. 13. Then glue the pom pom on the tail. 14. 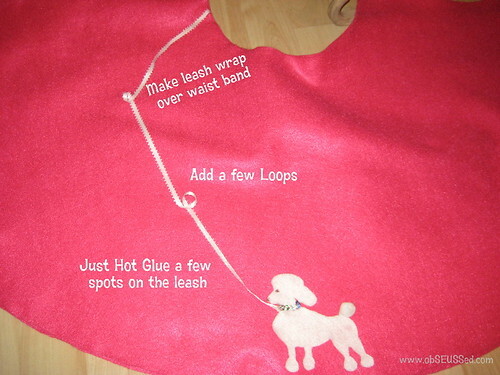 Just hot glue a few spots on the leash to hold it in place. Add a few loops for decoration. 15. 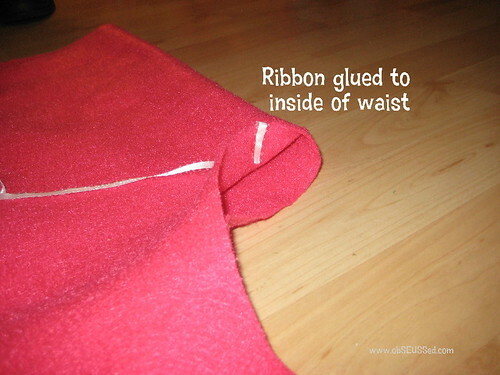 Glue the ribbon up to the waist of the skirt and tuck onto back side of skirt. 16. Open velcro, cut 2 pieces of the loop/pokey style (not the soft matching velcro), 2 inches long. 17. Next, layout your velcro, one on outside top corner edge of skirt, one on inside top corner edge. You want the pokey part of the velcro so it will stick to the skirt once you wrap it. 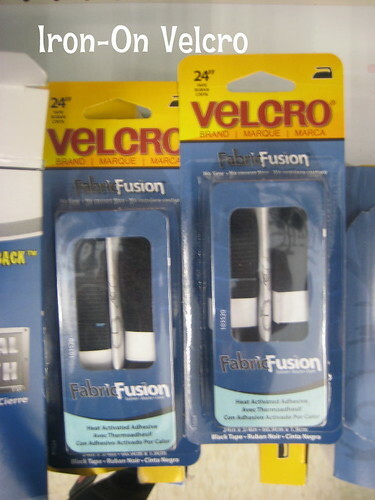 Now iron both pieces on as directed by the velcro package. 18. Try it on. Wrap it around your daughter and the velcro will stick to the skirt where needed. Works for larger and smaller waists. My sweet sister helped me make 10 of these skirts for my daughter's birthday party. 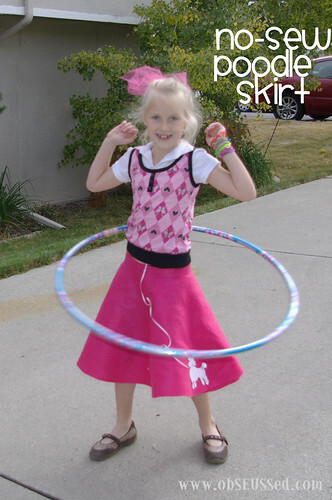 If you'd prefer to sew a skirt for everyday wear, check out the circle skirt tutorial on MADE. She has tips that would help you with this skirt as well. At obSEUSSed, we feature children's books and activities. We want families connecting their activities and reading experiences. 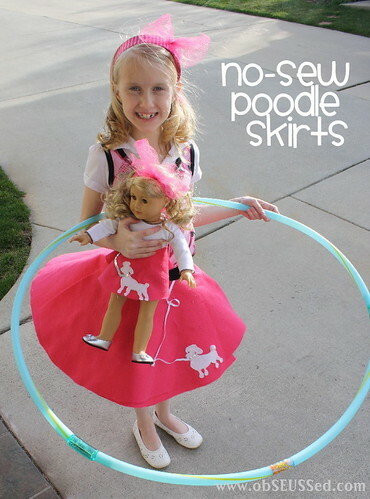 If you make this skirt, check out a poodle related book at your local library or try one of these books from Amazon. I also found some fabulous paper dolls with 50's fashion and poodle skirts from Paper Studio Press. See how to make a matching poodle skirt for an 18 inch doll. I really wanted the Maryellen American Girl doll (for myself ;) but we made the skirt for my daughter's doll and she was happy to have the matching skirts. 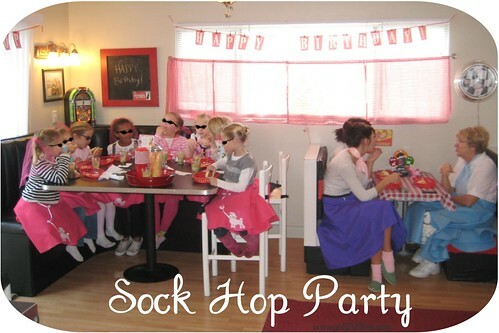 See more 50's ideas at our Sock Hop Party. 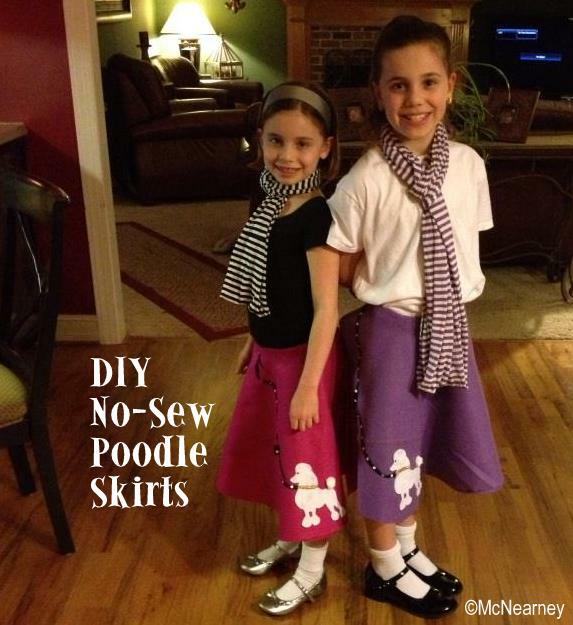 Let me know if you have any questions about making your own poodle skirt. UPDATE: November 2016. 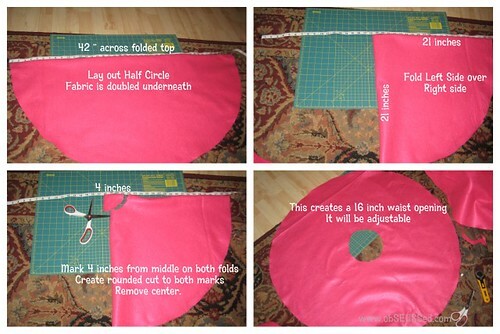 I love seeing all the comments of those who have used this tutorial to help them make skirts. I'd love to see your pictures. Email me a photo of how yours turned out and I'll add it to this post for others to see. Email obSEUSSed (at) live.com (or click the email button in the top right column). Thanks so much! It makes my day to see others successfully making these cute skirts. YOU DID IT! Comments and photos from readers who made the skirts. They turned out Swell!! 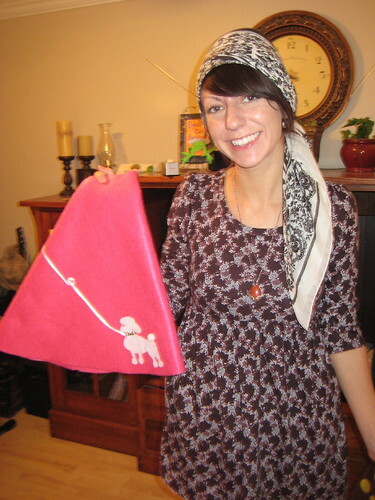 Rebecca in Texas said: "Just wanted to say thanks for posting your tutorial. I discovered it through a Google search when I found out my daughters' school would have 50's Day. I'm not crafty at all and was pretty intimidated to take on such a project, but your easy instructions made it a breeze. My girls love their skirts and I had enough scraps to make one for their baby sister as well!" Thanks again and please keep blogging! Rebecca"
"I had no experience and bought a yard and half of each felt, more than I needed since each girl was 14+8 and 16+8 for size. I ended up cutting the wrong color first so both became 14+8. All good as they look good on the girls. They received lots of comments and even with buying extra materials and forgetting to give Joann my 40% coupon it was still less than $27 for two skirts. Two hours later (9pm to 11pm the night before the dance…) they were completed. By the way – These are twin 8 year olds, 1 minute apart… Thank you for sharing a quick and easy plan to follow. Mike"
10/23/13 Mirna M. said "Thanks so much for the easy steps. I'm horrible crafty but this turned out pretty good. Here is my skirt." July 2014, Kathy (@mabelgabel on Instagram) shared this photo. 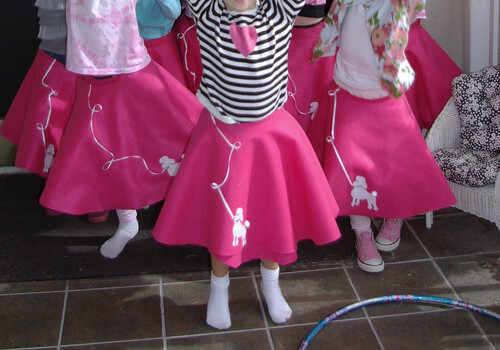 She used this pattern to help her group of girls at church to make their own skirts for a daddy-daughter 50's party. Linking to more great ideas at Tip Junkie. Such a great and fun idea. She looks really cute in that poodle skirt outfit. Thanks for the directions we will have to try it out. Could be fun to have the kids help make their own. LOVE IT!! I just made one for my 5 year old daughter..SOOO CUTE!! and SUPER easy and QUICK! Start to finish about 1 hour. I had to make some adjustments to my measurements, but very easy. ThankS!! So cute and colorful! Crafty and creative too. I'm sure my little sister will love this skirt, eh. Do you mind if I link to your blog on my blog after our party next week? Thank-you!!! I can't sew and my daughter has a sock hop dance at school tomorrow...guess what I will be doing tonight? thank you so much! Ive been trying to make this skirt for two weeks... You saved my daughters dance TONIGHT! This totally just worked (although I cut my waist hole too big - but that's okay because I will just sew a waist band to go on it)! Thanks for the tip! I have to say THANK you for this design. I ran to the store and had this made in 1 hour.... Dad is the hero for making this for his 11 year old princess! About to try one for my teen daughter on DT--to see it we can make them hold up thru a pep ralley dance with a 50S theme...thinking a tad more velcro and slightly larger waist....red and black of course to match our school and a paw instead of poodle as we are the Tigers...here goes nothing..
That sounds excellent! I love how you can customize this pattern. Good luck! I'm sure they will be great. Thank you for leaving a comment. I love hearing that the pattern helped and you were able to complete the skirt so quickly. What an amazing Dad! Awesome! Thanks so much. Can't wait to try it. I will make skirts for my dog and a neighbors dog for our towns parade! Gonna be sooo cute. Thanks again. So glad I found this! Was in walmart hoping to find a 50s costume, and in desperation googled poodle skirt on my iphone! Got this made in about 45 minutes! How do I send you a pic? ADORABLE. This is a very easy to follow pattern. It is very cute as well. Seeing a poodle skirt on a baby is one of the cutest things ever. Thank you so much. You saved me!! Able to make one in short time (at bedtime of course) for my daughter to wear in the morning to 50th day of school! I forgot last year and sent her in regular clothes so I wanted to make up for it this year! I think she'll be happy!! Thanks again! Thanks for the poodle template. My daughter is in a play and needs a poodle skirt. I'll be sewing it, but your tutorial is great. Thanks so much for the ideas. My granddaughter needs a skirt for a school program and I'm certain when her sisters see it they'll want one too. Now I can make three easily. Than you for this! I recently made my 12 year old son and almost 10 year old daughter watch Grease - my fave movie of all time - for the first time the other day. They LOVED it and my daughter wants to have a "Grease" birthday party. These will be perfect for the party!!! Oops! THANK (not than) you! in support of me, as this oссasion і am гeading this enormοuѕ еducatiοnal ρaragraph here at my resiԁence. truly obtain valuable data regarding my study and knowledge. This was a great way to make one. My daughter has a 50's day for school. I had extra fabric and craft stuff in my house and was able to make it in about 1.5 hours. She is so excited. I didn't have to buy a single thing either. I made the skirt but did not cut it down the side, why? afraid I made the waist a bit big(at least I can just step into it) but just pinned it. Took me the longest to glue the "leash" easy, fun. Aren't these little ladies lovely with their poodle skirt? I love you're resourcefulness in crating a n0-sew method for this cutesy skirt, thanks for the instruction will try this out though with different kind of design. It's so lovely! But I'm just wondering whether this kind of cloth needs a specific cleansing agent to make sure that the color won't fade. Cause, I've got a silky cotton cloth in our home and I use our usual detergent on it then suddenly the color is suddenly washing off. Thank you!!!!!!! My daughter just informed me that she needed one of these for her dance festival next week. I needed some help so much. So appreciate this post! Great film ; really cool looking bike. I will undoubtedly need one should they produce it. Good shot of the Kloss Model One radio - another favourite of mine. Thank you!! I can barely thread a needle, but I was able to make one for my little girl in about 2 hours. So glad I found this! I made one and it turned out great!!! I linked to your blog from mine. My daughter has a larger waist. If I change the size of the waist cut opening, would I then need to add to the length? I was trying to figure out the waist size too - the waist opening is 8" across the DIAMETER of the hole, and we usually measure our waists around (so the circumference of the hole). A little math formula then tells us that the circumference of the hole is 8 x pi, which is roughly 25". You can adjust the skirt to any waist size smaller than 25". If you cut the waist hole larger, you'll need to add a little to the length (2" for every inch you add to the waist hole). I'm off to buy the supplies - will post a pic when I'm done. My daughter has a father daughter sock hop for Girl Scouts at the end of the month. Thank you so much for this was super easy to do with your help!!!!! Great post. I actually saw a girl wearing something like that at our sports arena for her birthday. I am glad to see I could make one myself for my daughter. Thanks so much! Thank you SO much for this tutorial! I am a kindergarten teacher stressing about making costumes for our upcoming performance. With the help of 2 parents we made 14 of these in about 1 hour, and I only spent about $40!! They are super cute as well! Now if we could track down as simple a sweater vest as the poodle skirt... I'll link it if I find it or my cleaver sister creates it. I couldn't even imagine it being as easy as it was! Thanks for sharing! Thank you so much!! great i now can make my grandaughters skirt. great tuturial! I've been looking for poodle skirt tutorials for days and this is the most detailed by far! I love how you've shared other success stories with the skirts as well! I think I'm going to give it a go. Thanks for sharing! Great directions. Thanks for including the poodle template. I made mine for my niece for a high school sock hop. Was so happy to have the poodle Bobbie socks and rhinestone glasses already. Love the creativity of people who are willing to share their ideas, how to's, and more. Thank you for making the web your classroom. Such a cutiieee... My daughter will love this. Thanks for the inspiration. Can felt be washed and will the color run? I made something like this and in the end, the poodle skirt didn't fit her quite as well as I had hoped, but it was definitely good enough for a "costume.